nanjIyar and periyavAchchAn piLLai highlight that the arrival of eastern winds and the waking up of swans indicate the morning. They highlight that thoNdaradippodi AzhwAr requests that bhagavAn being Asritha vathsala (one who is very attached to his devotees), he should wake up now and bless his devotees. The eastern winds have arrived and is blowing with touching the well nourished jasmine creeper enroute. The swans that sleep in the flower-beds are waking up shaking their wings and feathers which have become wet due to the snow/fog falling like rain. You are the one who removed the sorrows of gajEndhrAzhwAn who suffered greatly in pain due to the poison from the biting of the crocodile’s sharp/hard teeth and the crocodile trying to swallow of its foot using the cave like huge mouth. Oh lord/master who is lying down in srIragangam who helped the elephant! please wake up now to bless us. bhagavAn revealed vEdham in his hamsAvathAram as said in periya thirumozhi 5.7.3 “annamAy anRu angu arumaRai payanthAy arangamA nagaramarnthAnE“. Since swans have woken up, AzhwAr requests srIranganAthan to wake up as well. As mentioned in vishNu dharmam “paramApadham Apanna:” – gajEndhrAzhwAn faced a great danger of being killed by the crocodile. But emperumAn arrived there, removed gajEndhrAzhwAn’s trouble, accepted the flower (which was held by gajEndhrAzhwAn for emperumAn) in his lotus feet and his service. This is bhagavAn‘s greatest favour. Similarly, he descended into srIrangam as srIranganAthan in archAvathAram to uplift all samsAris (who are present in the times after vibhavAvathArams). AzhwAr requests emperumAn to wake up and fulfill their cravings to be blessed by him (just like he removed the sorrow of gajEndhrAzhwAn). AzhwAr says “paLLikoL annam” – in dhivya dhEsams (which are very dear to emperumAn), everything – even swans, are given great respect. When emperumAnAr arrived at thiruvEnkatam (thirumalA), periya thirumalai nambi who is emperumAnAr‘s maternal uncle and one of the AchAryas, himself came to the streets to welcome him. When emperumAnAr asked why he himself arrived and did not send some one of lower stature to welcome him, nambi says “nammil siRiyArillai ingu vaththippAril” (among those who live here, there is no one lower to me in stature) – such was his humility. (similar to nanjIyar‘s vyAkyAnam) Since the swans have woken up, emperumAn who also appeared as swan should have woken up by now. Here AzhwAr says “vizhungiya” (swallowed) when really the crocodile bites and holds the foot tight. This is similar to a mother seeing child very close to an open well and screams “I lost him” out of fear. For “arum thuyar“, it is explained that the sorrow was so big that, perumAL himself jumped directly from paramapadham to rescue gajEndhrAzhwAn. Why are you still sleeping? 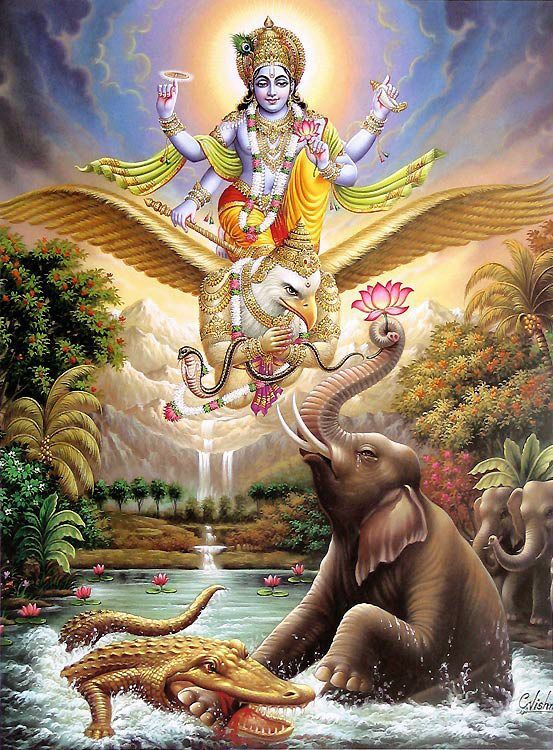 Would you not wake up and help us who are already fallen in this miserable ocean of samsAram and being bitten by five senses which are like five crocodiles? This entry was posted in mudhalAyiram, thiruppaLLiyezhuchchi and tagged thiruppalliyezhuchi thondaradippodi alwar on December 29, 2014 by Sarathy Thothathri. Adiyen Dhanyanen. Azhwar Emperrumanar Peria Jeeyar Thiruvadigale Saranam. Pray to my Acharyan to bless me to aattain HIS lotus feet.